Australia's farmed salmon is among the best in the world. With creamy spinach and buttery pastry, this is a simple, celebratory fish dish that punches well above its weight. 1. Heat a large frying pan over medium heat and add the butter. Fry the onion and garlic for about 3 minutes, stirring frequently, until softened. Add the cream cheese and milk and stir until the cheese melts. Add the spinach, stir and cook until the leaves have wilted and the mixture has thickened. Allow to cool to room temperature, then season with salt and pepper to taste. 2. Preheat oven to 200C. 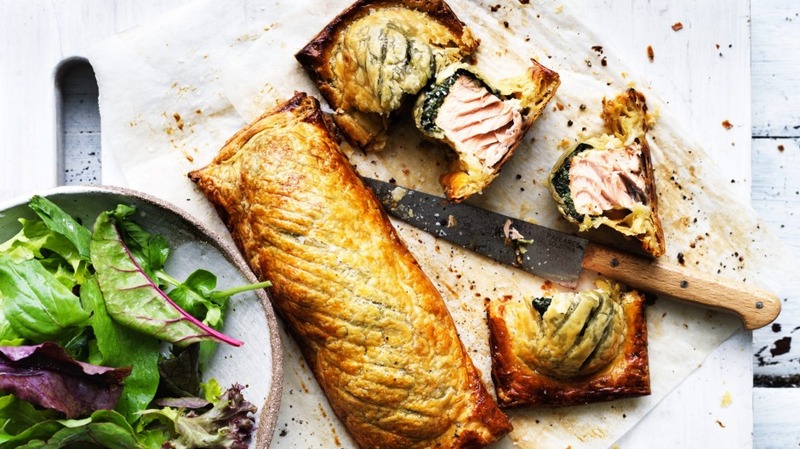 Place a salmon fillet on one side of the pastry and top with a quarter of the spinach mixture. Fold the ends of the pastry in and then fold the side of the pastry over to create a pocket, trimming any excess (use offcuts to decorate the top of the pastry if you like). Crimp the edge with a fork to seal. Repeat with remaining fillets. Brush the pastries with beaten egg and bake for 20 minutes until golden brown. Serve with lemon wedges. Serve with Adam Liaw's egg, beans and greens salad.